Some of my favorite things: Sunflowers, Tea, Franciscan anything! One of my favorite Aunts had a complete set of the Franciscan Apple -- including glasses. It was so much fun to have breakfast with her in the kitchen ... thanks for the memories! Beautiful teascape! Have a lovely week. Ho how wonderful that you take a pic for every month for your calendar 2018. This Fall image with the tea table is gorgeous, just perfect! I love it all... teacup, table topper and sunflowers. Betty, your Cozy Corner is indeed cozy - your tea setting looks so warm and inviting. I like the way you've used curtains to adjust the light for your photography. 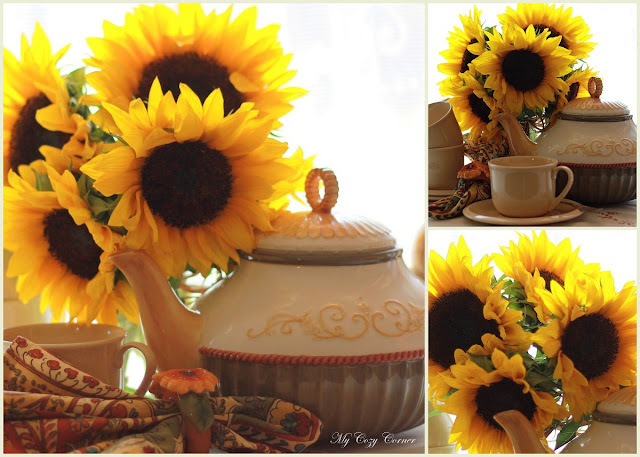 Beautiful tea time!Love sunflowers...Thanks for sharing! How can one now smile when viewing a sunflower? That is wonderful and they look so fresh. Someone gave me some seeds today for next year and I had seen them at Janice's house - like 8 ft tall! Lovely teatime table setting Betty - thank you for sharing. Betty, I love the sunflowers. The tea set is nice. Have a great week. Sylvia D.
I just love sunflowers - they really do brighten up a room (and a blog post!). Your teapot is lovely.